The national mobile service provider Mobitel launched a state-of-the-art Smart Bus Halt at Town Hall, Colombo as a step toward transforming Colombo into a Smart City. It was opened by Telecommunications and Digital Infrastructure Minister Harin Fernando and Sri Lanka Telecom and Mobitel Chairman P. G. Kumarasinghe Sirisena. 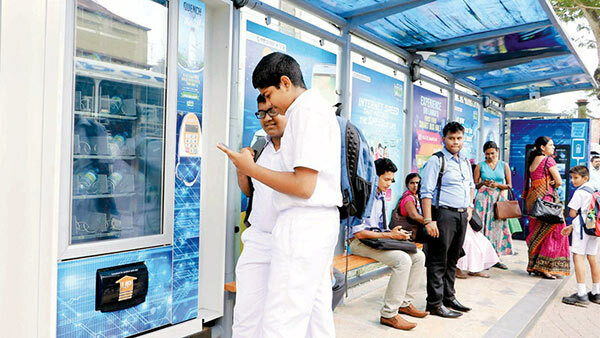 The Smart Bus Halt is equipped with 4G LTE and Wi-Fi as well as a Smart Vending Machine to dispense beverages with a touch of the mobile for cashless payments. For a limited time, the machine will also provide a free chilled bottle of water via SMS, Sri Lanka Telecom said in a release. The interactive touch screen at the Smart Bus Halt with its integrated facial analytics has the ability to customize onscreen content to suit the audience based on a multitude of characteristics such as age and gender. It also doubles as a self-service information portal with information on bus routes, train routes, timetables and localised details of ATMs among others, the release stated. Mobitel’s Smart Bus Halt, in-line with its IoT (Internet of Things) initiative, is equipped with state-of-the-art environment sensors which monitor temperature, humidity, noise level and toxic gas concentrations. The data gathered from the sensors will enable the monitoring of air quality on a routine basis. The Smart Bus Halt will also be equipped with a mobile phone charging station, the release added. colombo is a smart city with smart people dressed up smart educared in smart schools and and living travelling to smart places not necessaril traveling in smart buses. Board a bus around 1.30 20 pm you have to crane your neck outside the bus window to get some air…no necessirly fresh. What’s the point of having a smart Bus Stand when the Busses are terrible. The problem is that our leaders appoint mongrels to key industry leadership positions because they are the brother of ‘so and so’ and not because they are competent to direct a most critical SOE which could bring about rapid economic transformation. The SL Mobitel and the Comms Minister were taken for a ride to adopt the Google Baloon technology to provide internet coverage to our nation. They, I believe, were driven by a Silicon Valley based Sri Lankan conman towards that disaster. It is time SLTelecom was floated in the Colombo Stock Exchange so that the Chairman and Directors appointed by the investors will come under pressure to deliver a standard service and profits. That will enable the current Chairman to revert to the family’s paddy business in Anuradhapura.